In this Article, we will see the role of Modules, Controllers, $scope in AngularJS Application. Module: Module in AngularJS applications is a container for controllers, directive, filters, services etc and helps in packaging code as reusable modules. The first parameter in angular.module() function is the name of the module and the second parameter is an array in which we can add dependencies. Here, we have not added any external modules/Dependencies as we are trying to make this example as simple as possible. In the above code, We have added a controller with our angular module(i.e. myApp) using Controller method of the module. In Controller method, the first parameter is name of the controller and second is function representing the controller. $scope acts as a glue between application controller and the view. $scope is dynamically injected into controller's function. We have added some data to $scope properties. Here, we have added our module and controller in View using ng-App and ng-controller directive of AngularJS. Let's save and run the application. Let's move the entire <script> to new file i.e. 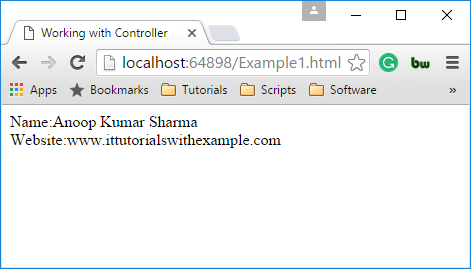 controller.js and add reference of that script after the angular script.